Have I mentioned before that I’m obsessed with earrings? If I have not, now you know. Even though you don’t see me wearing earrings in all of my posts, I’m an earring lover at heart. 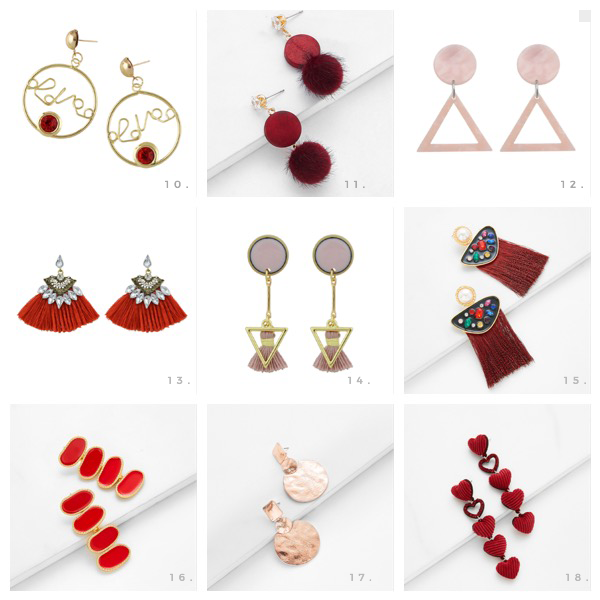 Since Valentine’s Day is around the corner and a good pair of statement earrings can make or break your outfit (or bank), and to help you a bit, I did some homework and found some budget-friendly pairs that you can take a look at, get a pair or two and wear them on this upcoming Valentine’s day. 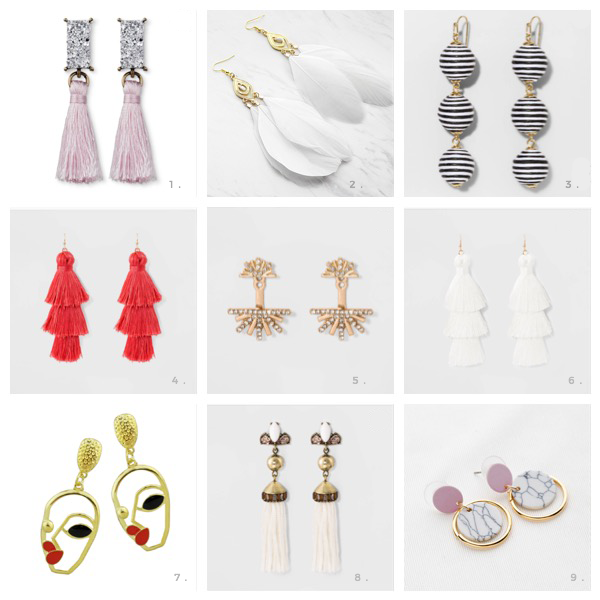 Before we get right to all of the choices, I have a few tips on how to wear statement earrings for any day and any occasion to share with you today. Let’s get right into it, shall we? The first tip I’m recommending you to wear your statement earrings is to make them pop. 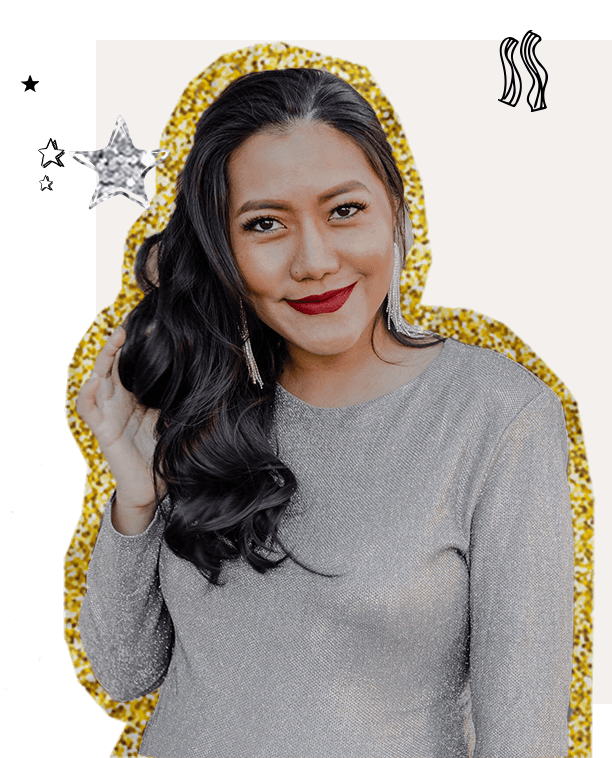 You have to make sure that your earrings standout from your outfit because they’re a statement piece and you want people to see them before they compliment you on other items. The way you can implement this tip is to put on the right outfit. You want to make your earrings pop by wearing simple style clothing. Try to stick with simple cut clothing, not a ruffle sleeve blouse or a tutu skirt. 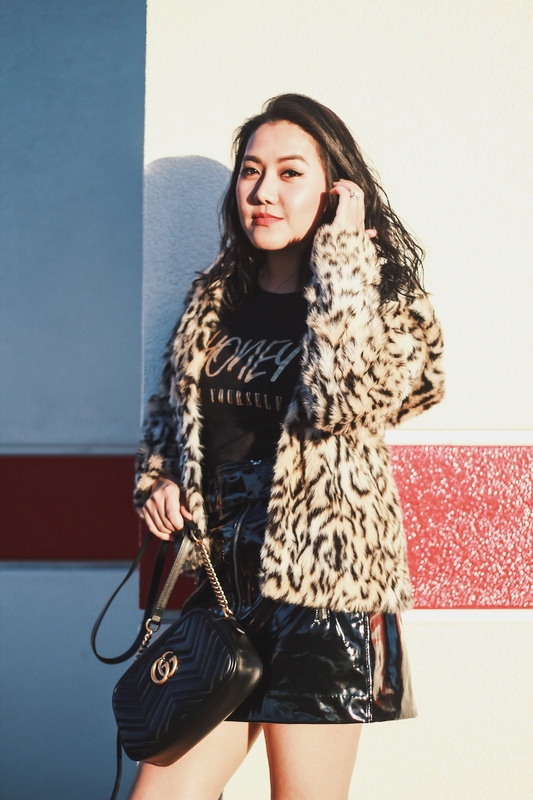 If you can pick the outfit that shows off your neckline or shoulders like a Bardot style top or dress, that will make your earrings visible as you walk into the crowd. You should also pick your colors of clothing accordingly, use soft and subtle colors if you pick the bright and intense colored earrings and switch them the other way round. The second tip is to leave your neck freely. You don’t want to overwhelm your neckline as your neck and shoulders will be the display base for your earrings. If you can put your hair up, or have any hairdos that will show off your earrings, this will help emphasize them perfectly. But if you can’t leave home without your neck accessories, try choosing the tiny dainty necklace instead of a big and noticeable one. Moving on to my last tip on how to wear a pair of statement earrings is to use the color contrasting rules (complementary color theory). If you don’t know the basic contrast color pairing are, you can head on over to google and search for “complementary colors list”, then you will see all of the pairing color lists come up. And even though I suggest you to choose your colors accordingly in the first tip, you can still want to play with color contrasting a bit. For example, if you wear a soft peach dress (simple cut of course, something like this), you can pick a pair of Royal blue earrings to contrast with your dress. This tip will make your outfit more interesting and make your classy dress look more fun. I don’t recommend you to go for a full saturation for both earrings and outfit but to keep your outfit in a softer tone than the earrings. Below I’ve picked twenty plus pairs of inexpensive statement earrings for you. Hope you will find the right pair to go with your outfit. Those are all of my easy tips on how to make a statement out of your earrings. If you have any other tips you’re using yourself, feel free to leave your comments below. P.S. If you have more of a budget, here are some pricey pairs that would be worth the investment. We’re growing up (aka getting old) so quickly and it’s sad when most of us can’t even be who we are. Since today is my birthday, I wanted to share my thoughts through my life experiences on why it’s very important to live your life for YOU and to be YOURSELF. I grew up in a society where people love to compare themselves to others. Never feeling secure about who they are. Most people just wanted to be like someone else but never themselves. They cared more about others’ opinions and feelings and forgot to care for their own. They respected themselves less than they should have. They loved to smile but underneath their happy faces, you can hardly find the real happiness inside. Sounds terrible, right? I once lived in that kind of society and I let that society guide me for the longest time. Over two decades, I never felt truly happy about who I was. It didn’t matter how hard I tried to improve myself (to be like someone else), and even though I achieved my goals, I never felt satisfied with what I put myself into. It was always something else that I wanted to do and be. I have to say that I never appreciated who I was but now I do. Since I’ve learned a lot from my past, I’ve realized how important it is to be and love who I am. I wanted to share with you today 5 important reasons why you need to be yourself. Let’s get into it, shall we? The first important reason why you should be yourself is the amazing feeling you will feel. Not being yourself can bring a lot of stress, headache, and depression to some. Because you are trying to live someone else’s life that wasn’t fit for who you are. Hence, by being yourself you can help get rid of (or avoid) all those problems. Then you will be able to decide what is good and not good for yourself by yourself. Which links to happiness because you are creating your own life you love and that feels pretty amazing! You don’t have to pretend and have to please everyone around you anymore if that’s not who you are. If you are a pleaser type, good for you. But it’s not good to pretend to be or do something thats opposite of what you want. You will be able to learn to adapt yourself to each situation and you can make the best choice on how to interact with others your own best way. The appropriate way without having to pretend. You will love yourself more. At one point you will love and care more about yourself than ever before. 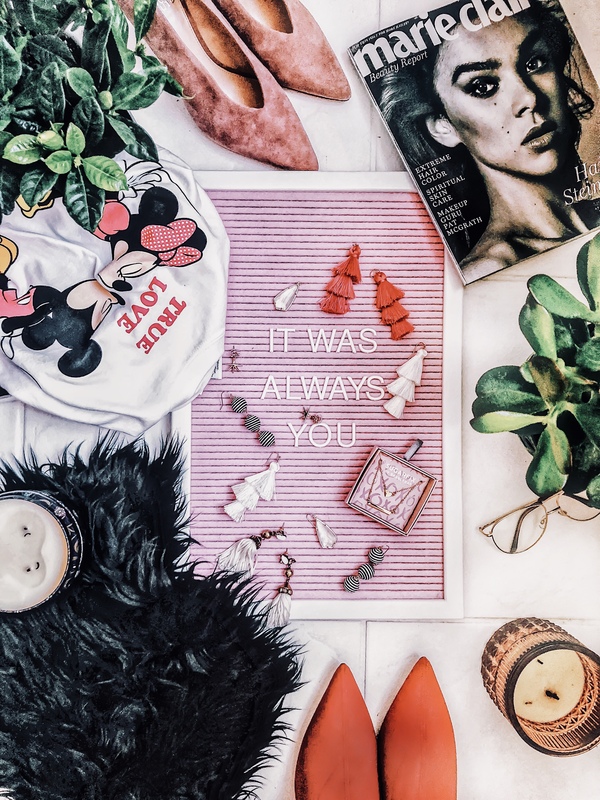 You will then know that you are super important as this quote by Diane Von Furstenberg says, “You’re always with yourself, so you might as well enjoy the company.”. That’s right! You will live with yourself until the end so why not give credit, love and care to yourself as much as (or more than) you give them to other people. The below quotes explains this very good too. The second you know who you really are and what ability you have and can bring out to this world, you will gain more confidence in yourself. Because it’s only ONE of YOU who can only give what you have and share what you love to others. No one else can do it better than you. And because it’s only you who is the ONE unique self, you don’t have to compare yourself with somebody else. That will help raise your confidence level effectively. You can easily achieve your goals. Remember when you followed someone else’s path and tried to achieve their goals? You don’t have to do that anymore. Because you know who you are and you know exactly what you want. You can start planning and achieving those goals without distractions from other people anymore. This means being who you are will take you to your goals quicker and easier. Those are just some of my point of views on why it is so important to be yourself. I hope all of the above reasons have inspired you somehow. You can read more of other peoples opinions on HONEY BE YOURSELF page. 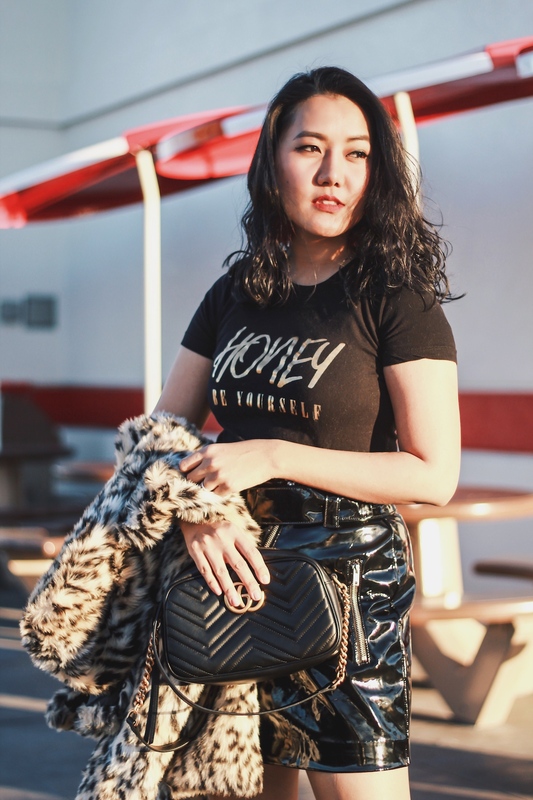 In today’s look, I’m wearing a Perfect Glam Crew t-shirt from my Honey Be Yourself collection. I choose to wear it with a patent leather skirt and a leopard coat. Finishing this look with a pair of black ankle boots. Ooh, and you can shop my HONEY, BE YOURSELF t-shirt collection here.